Our EUROGRILLE storefront gate is our best-selling coiling grille design. 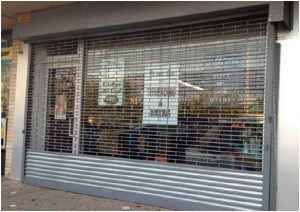 This is the same storefront grille that can be found on all of the storefronts throughout Europe. The EUROGRILLE is designed to protect your store and will bring style and beauty to any storefront. No other company can offer you any grille that will compare to CITY-GATES EUROGRILLE. 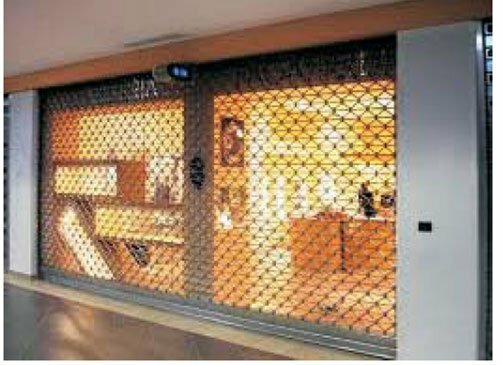 Security grille controls access at both interior and exterior openings. 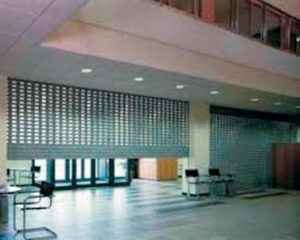 Applications include malls, commercial and industrial buildings. 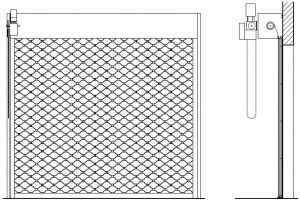 Curtain – Grille Curtain conforming to the following: Connecting rings are .14 gauge x 3/4″ electro galvanized. Horizontal tubes½OD by .18 gauge electro galvanized steel. Bottom bar to be heavy duty aluminum, reinforced with 3″ x 2″ x 3/16″ aluminum angles for widths over 27′-4″. 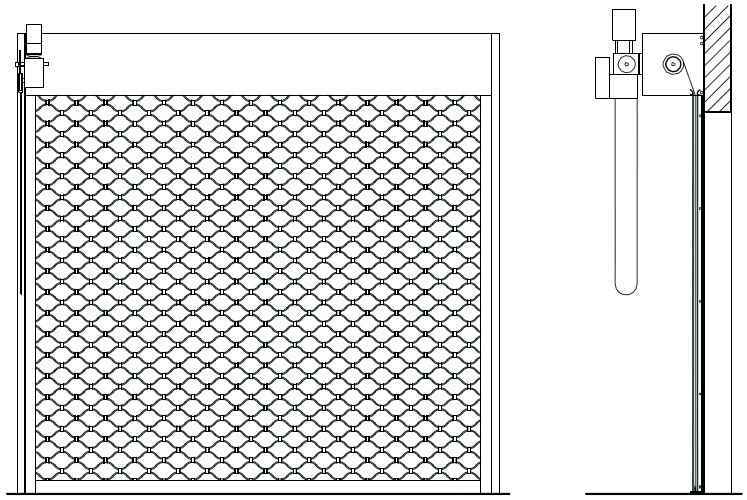 Bottom Bar – The bottom bar will be 6×2 roll formed 14 gauge galvanized steel to match curtain. Optional heavy duty aluminum extruded tube or double angle aluminum. Counterbalance – Counterbalance shaft assembly shall consist of steel pipe capable of supporting curtain load with maximum deflection of 0.03″ per foot of width and helical torsion spring assembly designed for proper balance of grille to insure that effort to operate grille will not exceed 35 pounds. Ball or roller bearings to be furnished at rotating support points. Provide wheel for applying spring torque and for future adjustment. Band springs for smaller doors. Brackets – Brackets shall be steel plate not less than 3/16″ thick with ball or roller bearings at rotating support points, bolted to guide assembly extension; supports counterbalance assembly and forms end closures. 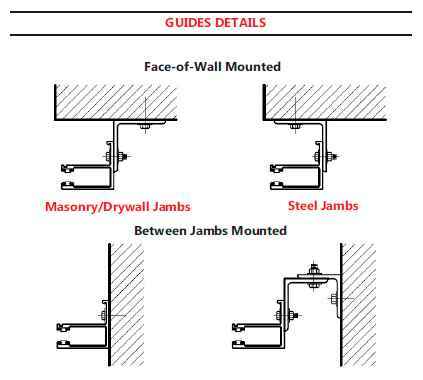 Hood – Hood to be omitted unless required (24 gauge galvanized steel) (0.4″ aluminum) (#24 gauge stainless steel). (Provide supports as required to prevent excessive sag). Operation –Operation shall be push-up, or chain hoist, or motor operation: For grilles up to 24′-0″ wide and 14′-4″ high, Model H listed motor operator includes motor, reducer, controller, limit swich, Motor Mounted Interlock overload device, roller chain drive and floor level disconnect for emergency push-up operation. Controller and push-button station or key switch are inNEMA1 enclosures. For grilles up to 37′-4″ wide and 14′-4″ high Model MO motor operator includes an open drip-proof motor removable without affecting emergency operation or setting of limit switches, heavy duty magnetic controller, rotary limit switch, Motor Mounted Interlock overload device, posi-lock brake system, adjustable friction clutch, 24V control circuit; all integral electrical components prewired to terminal block for ease of field wiring, heavy duty V-belt intermediate drive, #50 roller chain and sprocket final drive, floor level disconnect for emergency hand chain operation. UL listed operator. Controller and push-button station or key switch inNEMA1 enclosure. CG 2000 motor system. 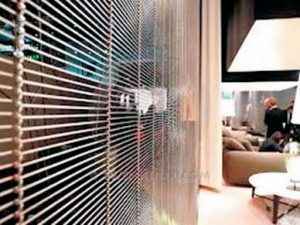 Optional release System Furnish Manual Release System with motor operated grilles. Actuation of the pull handle, after unlocking grille, disengages the motor drive and causes grille to open partially. Release of handle automatically returns to grille to normal motor operation. Locking – Provide for cylinder locks in bottom bar, locking at both jambs, operable mall side (tenant side) (both sides) (furnish with electric intrelocks at guides if H operator is used). Provide cylinder locking device on public side and thumb turn on tenant side when used with MO operator and Manual Release System. Standard cylinders may be replaced with masterkeyed cylinders (by others) if required. Consult factory for alternate locking situations.